I am a senior History of Art major and Museums and Society minor. In past years, I have worked closely with objects by interning with the JHMI Department of Art as Applied to Medicine archiving medical illustrations, letters, and photographs and completing a Nancy and Robert Hall Fellowship at the Walters Art Museum in the Department of Asian Art cataloging Chinese ceramics. These close encounters and an additional interest in the field of art conservation have led me to think heavily about the materiality of objects especially in the museum space. I hope that this course will continue to provide insight into these questions and that it will be a great adventure of discoveries! Travis Schmauss draws a tondo with a compass as Ross Brendle and Haley Huang look on. Image courtesy of Will Kirk, Homewood Photography. The readings for this class and our guest lecturer, Dr. Ilaria Cianchetta, conservation scientist at the Getty Conservation Institute, delved into the chemistry of slip and firing in an effort to better understand the ancient technique and process. After over a century of scholarship asserting a single, three-stage, firing process for Attic red-figure ceramics, recent advanced chemical and visual analyses and replication studies have suggested the practice of multiple firings for different stages of painting slip. Iron is the key colorant of red and black figure vessels, and is present in different oxidation states which give the fired ceramics their characteristic colors. Reds are related to the presence of hematite [α-Fe3+2O3] or maghemite[γ-Fe3+2O3] while the black areas are due to the presence of hercynite [Fe2+Al2O4] and magnetite [Fe2+Fe3+2O4]. The areas on red-figure vessels which turn black area are painted with slip, a refined clay extracted from the natural clay body by a levigation process. When a clay vessel painted with slip is fired in a kiln in the presence of oxygen to approximately 800 degrees Celsius, the entire pot turns red. When the temperature is raised further, nearing 1000 degrees Celsius and the oxygen is removed from the kiln through the addition of organic material (damp branches or sticks) to create a smoky environment, the entire pot turns black. At this point, the areas painted with slip begin to vitrify, and the slip layers form a glassy matrix that is less porous than the clay body that is not painted with slip. In the final firing phase, as oxygen is allowed back into the kiln as it cools, oxygen penetrates into the more porous areas of the vessel—namely the unpainted areas—turning the unpainted areas back into the red, but leaving the vitrified areas black. Dr. Cianchetta discussed the variety of analytical tools she utilizes to identify the different compositions and minerals of the clay, revealing more about the effects of firing on slip and clay bodies. 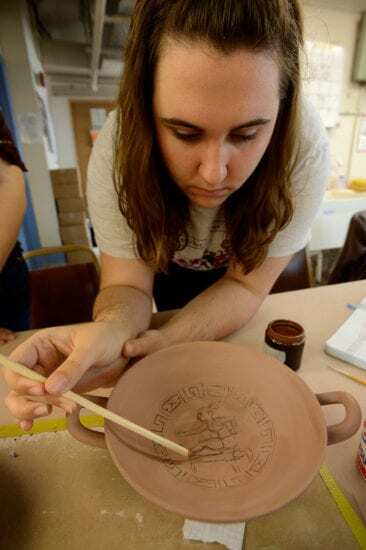 In addition to testing samples of Attic pottery using x-ray fluorescence, Raman spectroscopy, and x-ray absorption, Dr. Cianchetta has also attempted to replicate the slipping and firing process in an effort to recreate comparable results to the originals. But there is still more yet to learn; Dr. Cianchetta even posed a question for us for when we fire our vessels in the coming weeks—she asked us to look for evidence of a flame inside the kiln during the re-oxidation phase of the firing which would account for the more vitrified upper areas of the black slip, relative to the ceramic surface. Elizabeth Winkelhoff uses a linierhaar brush to begin painting the relief lines on her group’s cup. Image courtesy of Will Kirk, Homewood Photography. Following our discussion with Dr. Cianchetta, the groups quickly got to work collecting their cups and beginning the process of transferring images with slip onto our respective vessels. We attempted to stay as true to the ancient techniques and tools as possible. A compass assisted in marking the circular tondo on the inside of the cup where the main image would be placed. Then, the design was drawn with charcoal as a guide for painting the relief lines. A linierhaar brush, made with 2-3 horse hairs or cat whiskers, laid down the relief lines that compose the outline and details of the figure; the slip needed for the relief lines is a pasty consistency in order to adhere to the hairs and to stick to the surface. By contrast, small round brushes could be used for the broader, more rounded contour lines that go around the outlined figures, and also for the geometric Greek key pattern surrounding the image. It was interesting to see the variety in images and organization of labor. Every design needed to include a figure, a pattern, and inscriptions inspired by those of ancient kylikes but with a contemporary spin. For two of the groups, this meant rectifying the absence of women in ancient Greek contexts like athletics and scholarship. The groups, consisting of 3-4 people, found ways of collaborating and organizing labor to be most efficient. While one person could draw the figure, another the pattern. Two or even three painters applied slip simultaneously. One can imagine and appreciate the efficiency of an organized workshop of potters and apprentices after attempting the painting process in small groups. 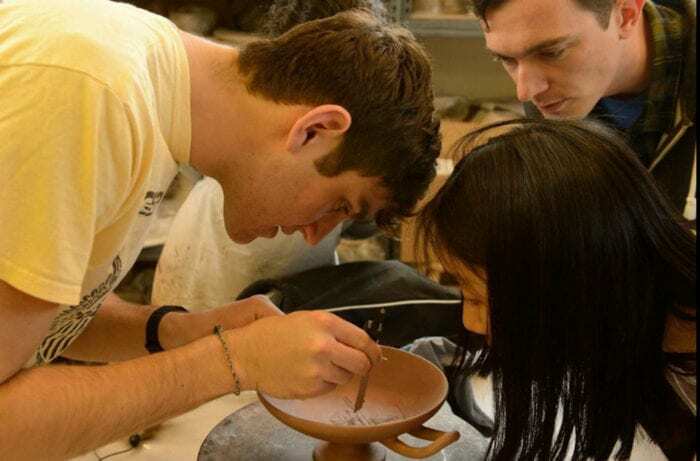 Every step in this process reveals more and more just how reliant the production of the kylix relies on the organization of the workshop, its apprentices and masters. Cianchetta, Ilaria, et al. “Investigating the Firing Protocol of Athenian Potter Production: a Raman and Hi-Resolution TEM study.” Microscopy and Miscroanalysis 20 (Suppl 3), 2014: 2038-39. Great post! I didn’t even realize the parallels we made unintentionally to the original process. Working with the linear haar wasn’t as difficult as I thought it was going to be, but it took some serious adjusting and switching between different types of hairs to get the right feel for it. We also ended up using slip that had some sort of mold in it since it had a practically perfect consistency. It makes me wonder about the sorts of things that the ancient potters put into their slip and if there were similar things going on. I was intrigued by Dr. Cianchetta’s proposal of a multiple firing process for the vessels because, while similar to Dr. Walton’s (to whom we spoke earlier in the semester) in that it calls for more than one firing, it differs in the sequence of painting and firing from the process he suggests (Walton, Marc, et al. “Material Evidence for Multiple Firings of Ancient Athenian Red-Figure Pottery,” Journal of the American Ceramic Society, 96, 7, 2013:2031-2035.) When we asked her about this, Dr. Cianchetta responded that it is possible that there were different firing sequences used and that it may even be presumptuous to assume that we can make a single definitive statement about Greek firing processes. This is interesting to think about because it could mean that the difficulty generations of scholars have had characterizing the firing process may be because they have actually been looking at different firing processes and trying to combine all their characteristics into one. Thanks for the post Gianna! While my team was working on our cup, we realized that having a thicker slip really helped when it came to getting the slip to stick onto our brushes. (I had brought in some slip that had been mostly evaporated.) We used some brushes made of feather tips that I brought in from my personal experiments and quickly realized how difficult it was to draw a long, continuous line without showing an obvious beginning and end to each stroke when we had to redip our brushes. This thick slip and feather brushing seems to work well for our relief lines, but I believe we will have to approach contour and background lines in a very different way with different slip consistency and tools. I feel like it’ll simply be a matter of practice, practice practice, although we don’t have that much time left at all. As we continue to hear from these various experts on firings and painting technique, it strikes me that we are trying to make broad generalizations about an art practiced over thousands of years and hundreds of miles! It is entirely plausible that different workshops employed different methods at different times to execute their final product. However, getting to hear from these different scientists is truly enlightening because, at this point, we have no idea if methods were standardized. Ultimately, we are developing our own methods based on the culmination of readings and practice! This is really exciting because it is the first time I have been exposed to such freedom in an academic setting. My group (Savannah, Arthur, and I) is trying to quickly finish the painting in the limited amount of time we have left before firing. Unfortunately, we have not struck the right balance of slip viscosity and brush thinness to exactly apply the technique of linierhaar, but I am confident in our ability to produce a design that recalls the themes of the vessels we have looked at! I agree with Elizabeth that the linearhaar wasn’t as difficult to work with as I thought it would be, especially with a thicker slip, but it was extremely time consuming. It became easier as I got the hang of it, but it still seemed inefficient to lay each line down individually. Despite the fact that my group had three people working at once, we didn’t finish all of the relief lines and they still weren’t as thin as the ones I looked at later on the cups in the museum. With the precision and skill needed to apply such lines I can easily imagine up to four people painting the slip in separate stages, this would also ensure greater productivity. The biggest difference between painting our cups last week and past experience we’ve had with using slip is that Professor Balachandran brought in slip with a creamy consistency (it also smelled like old parmesan cheese, so it was probably moldy), rather than a watery one. This changed everything! Brushes worked differently and it was easy to create a raised relief line. I think that the most important improvement with the creamy slip is that the linierhaar brushes became usable. They seem completely unable to retain watery slip. My group used linierhaar brushes on the meander pattern around the tondo, and a small paint brush on the outline of our figure. It was incredibly difficult to use the linierhaar brushes made with stiff horse hair on a long, curved line! The slip seemed reluctant to transfer from the brush to the pot when I tried using the brush this way. The hairs (1-2 cm) may have been too short for producing long, curved lines. They were excellent at producing laid lines (we read about these in Artal-Isbrand, Paula and Philip Klausmeyer. “Evaluation of the relief line and the contour line on Greek red-figure vases,” Studies in conservation 58, 4, 2013: 338-359), which made for a very clean meander pattern. I think that using a longer, more flexible hair in the linierhaar brush would produce controllable curved lines (with a bit of practice, of course). Over the past couple of weeks an issue that has been brought up repeatedly is how the ancient painters could see what they were painting on the pots, since the slip tends to quickly dry once applied and becomes hard to see. For this reason it was very interesting to note that, when my group applied the slip, we could see where the slip covered our charcoal sketch, thereby seeing what we’ve already painted. Assuming the charcoal will burn off in the kiln, this could be a valid solution to the visibility question. Great post! This class was really the time when our connection to the ancients was most poignant. As I applied the slip to the tondo of the cup, I really felt like I was stepping backwards in time and into a workshop of old. It made me feel like I was accomplishing what this course is about, understanding the Ancient Greek world in a real-life, personal way. With such a strong connection to the past, it put perspective on all of my other knowledge of the Greco-Roman period. Great post! The painting was not as difficult as it seemed to be the first time tried it probably because we are using a thicker slip that evaporate slower and thus allow us to see where it was painted on. My group has yet to paint the image in the bowl of the cup and I would expect that to be the most challenging part to come. I totally agree with Ashley, the linierhaar worked far more with the thicker slip than I had originally anticipated. It worked really well with the lay-line method of laying the hair with the slip on the pot and then directly lifting it back up. But, like Maddy mentioned, slip tends to dry up very fast, even the significantly thicker version. The slip was definitely unforgiving when it came to mistakes, and if you accidentally laid the linierhaar in the wrong place, the slip dried too fast for any real corrections to be made. This was definitely frustrating to say the very least. It will certainly be an interesting experience to see how cooperative the slip will be as we begin to work on the contour lines and the background. Gianna, thank you for the post, and especially for the large image of me in profile. I wish I had taken a step back that day and observed the class as you did for this post. I want to point out here that we found success in using the tip of a small feather to paint relief lines, as hard as that is to imagine. I liked learning about the new techniques we hadn’t seen before from Dr. Cianchetta. In the image I’m getting ready to create the outer band of the tondo. It was thrilling attempting to make a circle centered as perfectly as did the ancients. There isn’t a whole lot of room for error, and all of the mistakes we’ve seen from the artifacts come to mind. I think tomorrow will be just as much fun as last Thursday, with us doing the contour and background painting.